Definitions of extreme energy often come with lists of examples (e.g. tar sands, mountain top removal, deep water drilling and fracking) that the term is said to encompass. Extreme energy is often considered as a category into which can be consigned all the new, more intensive and environmentally destructive energy extraction methods that have been spreading across the globe in recent years. In fact it can be hard to find a clear and concise definition of extreme energy that does not rely on listing a set of examples. A reasonable attempt at such a definition would be ‘a group of energy extraction methods that have emerged in recent years as the availability of fossil fuel resources has become more constrained’ but in many way this just poses more questions than it answers. What decides whether a particular method should be included or not? How extreme does a method have to be? What does extreme in this context mean anyway? A definition like this certainly leaves a lot of unanswered questions in its wake. Potentially many of these questions can be answered by simply expanding the definition but needing several paragraphs to define a two word phrase is far from ideal. 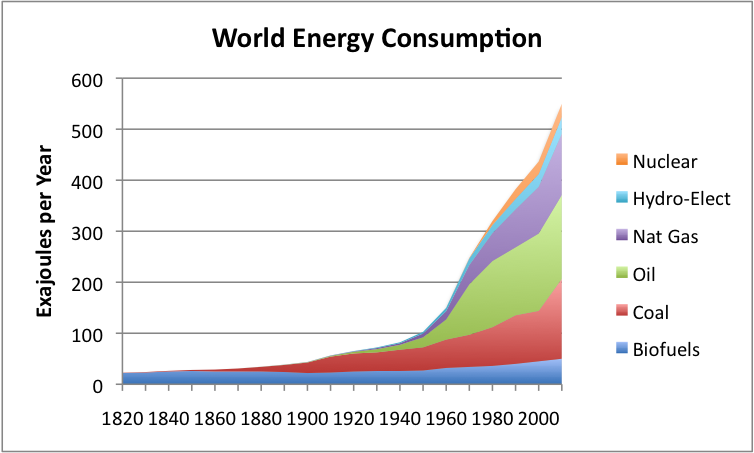 Perhaps this category approach is not the most useful way to view extreme energy. A category in itself does not have a great deal of explanatory or predictive power and comes with the problem of how to decide which energy extraction methods are extreme enough to make the cut. More importantly, extreme energy is part of the ecology of human interactions with the natural world and a definition that finds its basis in those interactions might be much more satisfactory. An alternative to extreme energy as a category is that of extreme energy as process. At its simplest this process can be described as the easiest to extract resources are targeted first and, once depleted, successively harder to extract resources are targeted, resulting in a steadily increasing extraction effort. This is basically the ‘Best First Principle’ which economist David Riccardo noted as early as 1821. This principle is based on a number of assumptions, namely that the system will try to extract the easiest resources first, that the resources are distributed with a variety of levels of extraction difficulty, and that the system will keep trying to exploit more difficult to extract resources when the easier resources are depleted. None of these assumptions appears particularly controversial when it comes to fossil fuels, or most other resources for that matter. So far we have not mentioned what resources this process applies to and it it seems likely that it applies to most resources that humans exploit, be it minerals, timber or fish. However for these purposes we will focus mainly on energy resources, and consider extreme energy rather than say, extreme cod. It is easy to see how the process of extreme energy could be seen almost as a scientific law, similar perhaps to the Second Law of Thermodynamics (which states that in a isolated system any process will tend to increase its disorder), in that it is statistical in nature. While it is possible that due to some fluke the most difficult to extract resources might be discovered, and exploited, first and then easier to extract resources might only be extracted later. In reality this is extremely unlikely to happen, just as with thermodynamics it is possible, but incredibly unlikely, that the random motions of atoms might reconstruct a candle after it has been burnt. Certainly on a global scale, with huge numbers of entities involved in extracting energy at a wide variety of locations, the probability that the average extraction energy effort will not continuously increase with time, is vanishingly small. It should be noted that in this process conception, extreme energy is not something that is in any way new. It has existed throughout history and in every society to greater or lesser extents. There are plenty of examples of the process of extreme energy at work over the whole history of oil drilling and coal mining. The first known exploitation of coal, in Britain at least, was via the collection of “sea coal” off beaches, which is a very low effort activity. As the amount of available sea coal was depleted tunnel mining became the norm and now most tunnel mines are exhausted and opencast mining dominates. Similarly with oil drilling there has been a progression from the first exploitation of natural oil seeps, through a succession of ever more intense conventional drilling, culminating in the deep water and arctic oil drilling of recent years, which involve vast amounts of effort. 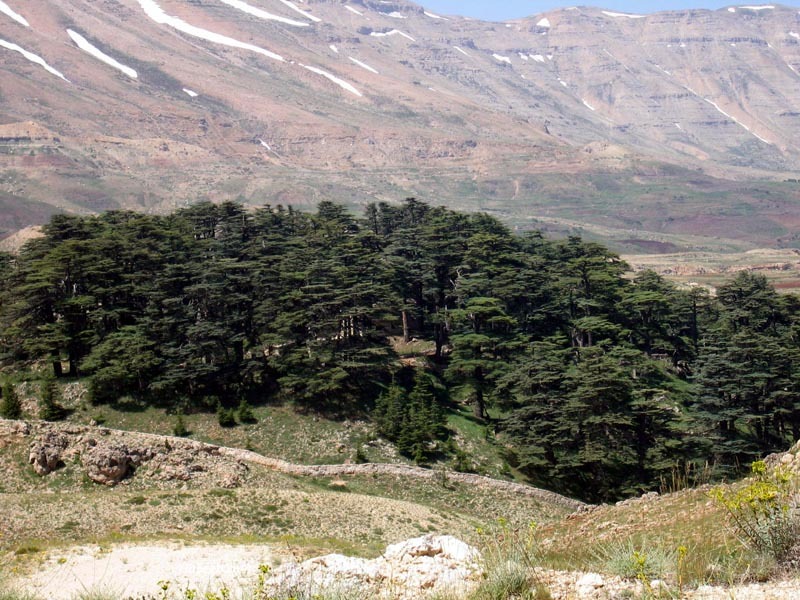 However we see signs of the effects of the process of extreme energy even in the oldest known surviving written story, the Epic of Gilgamesh, which in part deals with the deforestation around the cities of ancient Sumer, in southern Mesopotamia, the increasing efforts needed to acquire wood and the environmental consequences of the deforestation. The process of extreme energy can be seen to be far from just a recent issue. In fact during the last major energy crisis in the 1970s some attention began to be paid to the amount of energy that is needed to obtain energy. The concepts of energy return on investment (EROI) and Net Energy were developed, which are very closely related to extreme energy. Both are slightly different ways of measuring the fraction of energy extracted by a process that needs to be used to run the process. EROI is more relevant to the mechanics of energy extraction and focuses on the fraction of energy produced divided by that is used to run a given process. Net Energy is more relevant to the system as a whole and focuses on the fraction of energy that is available to be used after the overhead of energy extraction is subtracted. While these two quantities are somewhat different they are completely interchangeable, in that if you know one the other can easily be calculated. However, accurately measuring these quantities for real energy systems is far from easy, since it is necessary to account for all the energy inputs into the process. The complexity of modern energy extraction technology, the fact that modern economics does its accounting in money not energy and the secrecy of commercial operations all make it very difficult to measure energy inputs. There are also subtle issues around where to draw the line in terms of measuring energy inputs (i.e. what is part of the extraction process and what is part of wider society?). These various difficulties have contributed to a general lack of attention paid to these concepts in the decades since their invention. 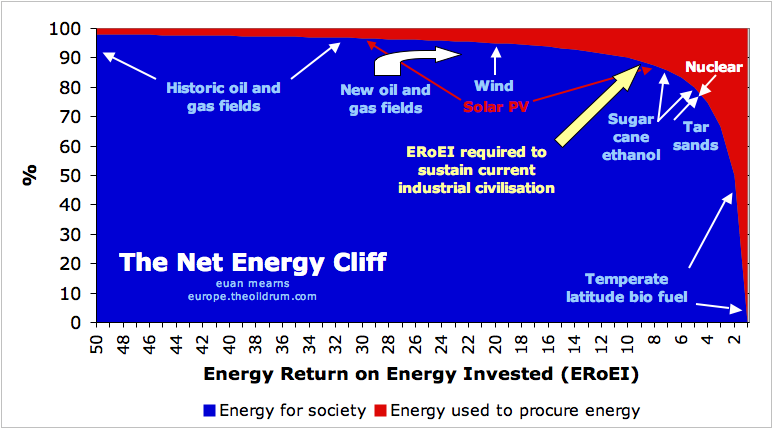 More recently however, these concepts have been used to develop the idea of a ‘net energy cliff’. This is based on the fact that the mathematical relationship between EROI and Net Energy defines a curve, with a sharp drop off to zero Net Energy at low EROI. An energy source with an EROI of 10 uses twice as much energy as one with an EROI of 20, but the difference in Net Energy that they produce is not large, 90 and 95 percent of the total energy extracted respectively. For high EROI energy sources, the Net Energy tends towards 100 percent very slowly and large changes in EROI make very little difference to the resulting Net Energy. For low EROIs (below around 8) though, the Net Energy plunges precipitously towards zero percent. Since EROIs for energy sources are declining (as expected from Extreme Energy) the system is being pushed towards this Net Energy cliff. Once the EROIs get close to the cliff, the effects Extreme Energy on society should become apparent at an accelerating rate, since the effects on society are most related to Net Energy. Only if the decline in EROI slows down for lower EROI sources could this be avoided. What data does exist does not suggest that such a decelerating decline is very likely. This being the case, it can be expected that the rate at which energy extraction becomes more intense will increase with time. The most obvious insight that can be gained from viewing extreme energy as a process is that the dominant factor driving that process is energy consumption. Extreme energy has always existed but due to the huge amounts of energy used by the present system it is proceeding at a much faster rate. The higher the rate of energy consumption, the faster that resources are depleted and the more rapidly the process of energy extraction becomes more extreme. The insistence that present levels of energy consumption must be maintained, and even increased, makes this process inevitable. On the other hand reducing energy consumption would slow this progression towards more extreme extraction techniques. The present system seems unlikely to adopt such a course however. The intensity of extraction effort needed translate pretty directly into the fraction of the world economy that must be devoted to energy extraction, and therefore dictates the fraction that is left over for the rest of society. If allowed to continue unchecked extreme energy will result in massive, though very poorly understood, changes to the world we live in. To summarise the process definition is: Extreme Energy is the process whereby energy extraction methods grow more intense over time, as easier to extract resources are depleted. The process is driven by unsustainable energy consumption and is important because extraction effort is strongly correlated with damage to both society and the environment. This entry was posted in Blog and tagged Extreme Energy. Bookmark the permalink.